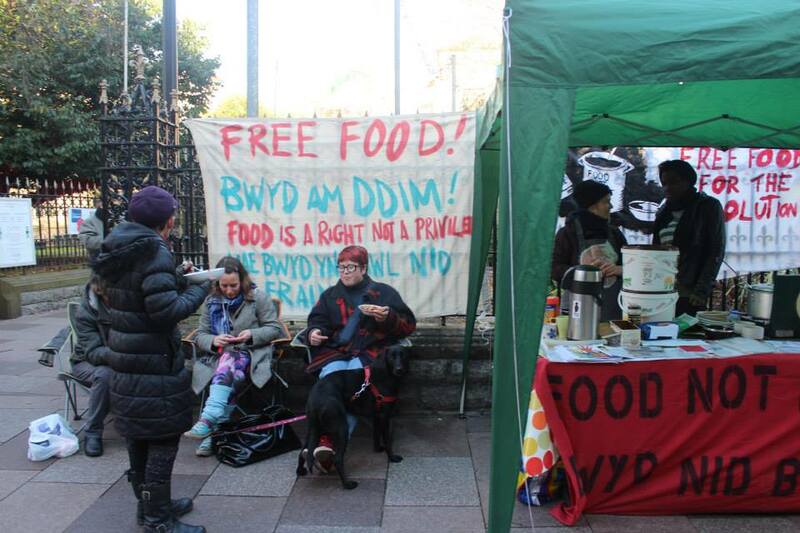 If you would like to be an active part of Food Not Bombs Cardiff, that would REALLY help because we are just a small group of individuals and some people get tired because they do so much! It would be great to share out the work more! Here is how you can help! 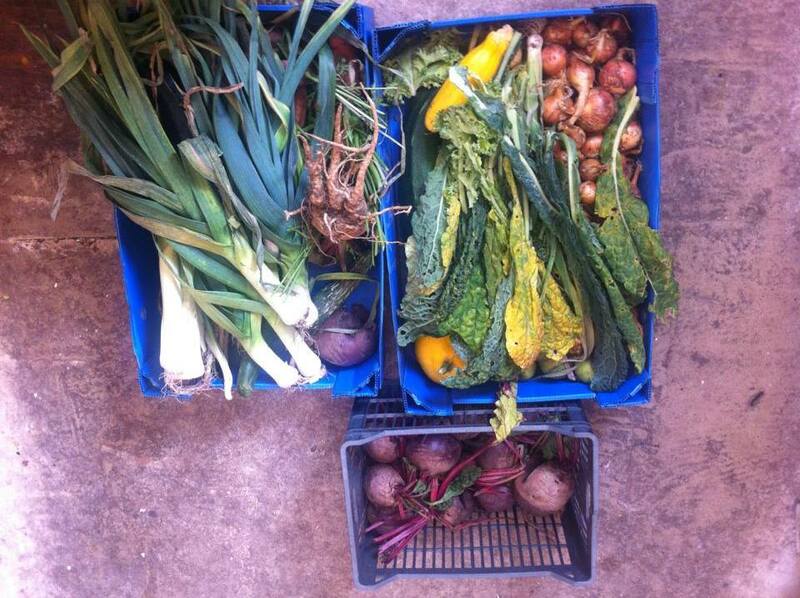 Sourcing Food (as many people as possible) – Throughout the Week! Food Not Bombs like to use food that would otherwise go to waste, this helps in highlighting how wasteful our capitalist society is. Maybe you can speak to your local corner shop or super market and see if they would be able to donate any vegan food – surplus vegetables, fruit, dried beans, tinned goods, bread etc. If you can collect this food and organise to bring it to the Wyndham by the cook, this will stop us having to buy ingredients! If you sign up for cooking make sure you speak to other cooks to make sure food has been sourced and that someone takes responsibility for having the keys & opening up the kitchen. Food donations can be brought at 6pm, or earlier in the week if someone has organised to drop it off. If you have an idea for a recipe, bring it along, we also have some recipe books. If you are not following a recipe, don’t just chuck everything in the pot because it won’t taste good – fry onions with spices & garlic, followed by fry-able veg (celery, carrots etc), then root vegetable / dried beans & lentils, along with boiling water, or tinned tomatoes and plenty of seasoning (stock, salt & pepper). This is the most tiring part of Food Not Bombs, but if we all split the work hopefully no one will have to do it more than once a month! The shift starts at 10:30am at the Wyndham Diner, make sure someone has got the trolley from The Wells Hotel (around the corner) before this, and bought soya/almond milk if we don’t have any stocked. When you are in the Wyndham, get the food ready, if it is pasta or rice dish you will need to cook this in the morning too. Fill up the urns with hot water, cut up bread and make sure the washing up buckets are clean and that all cutlery and bowls are clean too. When you leave the kitchen, make sure everything is clean including brushing & mopping the floor, and cleaning the surfaces. Lock up all doors when you leave. You should leave the Wyndham Diner BEFORE 12pm. Push the trolley, to our serving spot opposite the back of Cardiff Central Market. You will meet the other people on shift here (info on details of what to do in next section). After the food has run out (or if people want to finish at 2:30pm), everyone helps pack up – make sure all dishes are washed etc. Take stuff back to the Wyndham (make sure everything is clean!) – then drop the trolley back at The Wells! Meet the people doing full shift at the serving spot, and together put up the gazebo, set up the table (wipe it down), put the table cloth on. Set up the cooker, tea & coffee station, and put the leaflets out, and the banners up. Get hot water from The Cardiff Story (opposite House of Fraser) – we use a three bucket washing up station – 1. Rinse, 2. Wash the dish, 3. Final VERY hot rinse. A fourth bucket should be placed at the enterance to the kitchen/serve area to be used as a hand-washing station to everyone entering that area to serve. – 2 Serving (One for Food, One for Tea & Coffee): make sure you have washed your hands at the washing up station, on the way into the ‘kitchen’. If you leave the ‘kitchen’ wash your hands again on the way in. – Flyering / Engaging With Public: we are a group dedicated to non-violent direct action, especially around issues to do with war, poverty & food waste. You can flyer people walking by, or you can talk to people who are taking the food. You can also go and find homeless people who are on the streets, to tell them we are serving food and they could come along if they want. Hi, I’d like to help cook food please! I love cooking eastern food, but would love to make my passion worthy of something by helping out. 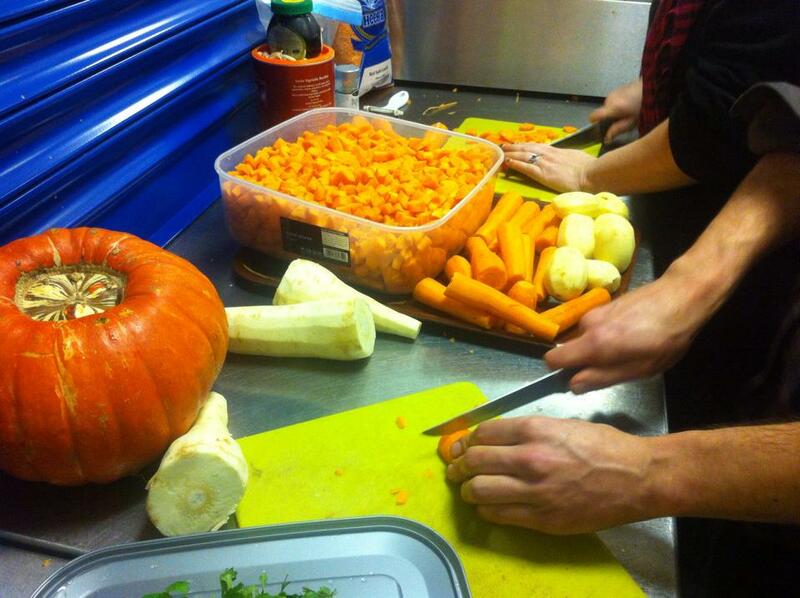 We have a new kitchen at Wyndham Diner in Riverside & have been busy cooking for Cardiff Anarchist Bookfair! This week’s recipe: Butternut Squash, Lentil & Ginger Soup.